Oh, this is so gorgeous! It looks so real and just brightens up the house! I love it! Love it great for closed spaces! Great picture, very clear and easy to install. Product as described. Gives the feeling of serenity without being at the beach. I placed it in my half bath and I love it. Somewhat challenging to install, but my husband had experience in installing window tint so he used some tricks he picked up in that line of work. It looks great in my daughters new room! I got this because my company relocated to a new building and even though I had been in a window office previously, I got gypped out of a window office in a random drawing for the new location . For a year I fought this decision through the union, with a doctors note for claistrophobia and anxiety and felt I could not stay at this job working long 10 hour days without a window . My last resort after getting fancy lights and built in time in my day for breaks was to get this window and post it up in my office. It worked ! I am much happier now. 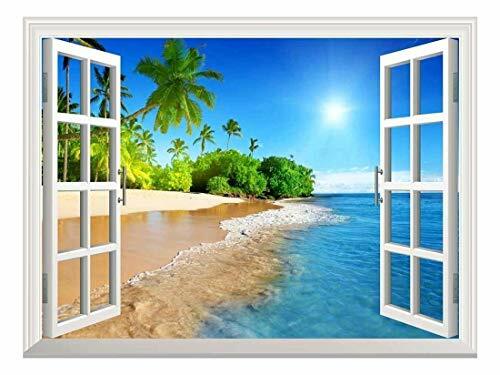 My brain thinks I have a window because I can look into the horizon and somehow it registers joy! So I am no longer bummed about no window in my office looking at the energy towers. I love this and it feels refreshing and joyful! Love it! Perfect for my office wall. I got this for my cubicle at work and it is awesome! Window view of the ocean now! Love love love it. Received many compliments. Looks very real. Best purchase ever.